I love when I discover a fragrance that's joyful, sensuous and flirty all at once. And that's exactly what Twirl by kate spade new york brings to the table. A blend of floral and fruity notes make for a delightful sensory experience. Many varied scents have been combined to reach the joyous end -- mandarin, bergamot, baies rose, pink watermelon, white peach, red currant, blackberry, star jasmine, magnolia, orange blossom, tiare flower, sun-kissed skin accord, French macaron, luminous musk and amber. It may seem like the fragrance would become overpowering ... but it doesn't! It's one of those scents that draws both the wearer and the smeller in, causing anyone who comes close to say, "Wow, you smell amazing." And the bottle? 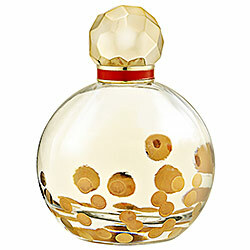 It's only one of the chicest, most fun bottles around. The round glass silhouette is speckled with gleaming gold dots for a disco ball-like effect. Definitely vanity-worthy. Twirl by kate spade new york retails for $65-$80 at sephora.com .